As we learned in our previous post, Seattle Tunnel Partners will need to excavate a large "retrieval shaft" in front of Bertha, their ailing Tunnel Boring Machine (TBM), to remove the Cutterhead and service or replace the Main Bearing. I discovered that a similar incident took place in 1993 at Sarnia, Ontario. A TBM drilling a new railroad tunnel lost it's main bearing, and a retrieval shaft had to be constructed to remove the Cutterhead and replace the main bearing. The Repair Pit has to be excavated ahead of the sick TBM. Then the TBM is driven through the wall into the Pit, to insure a seal between the TBM and the Pit wall, preventing incursion of soil material. At half the diameter of Bertha, Excalibore was down for nine months! The Repair Pit was started on January 31, 1994. The Cutterhead and Main Bearing were lifted out on June 30, 1994, and work completed three months later. Burned up an additional USD4.2M. Here is a sneak preview of what Seattle Tunnel Partners now facing. 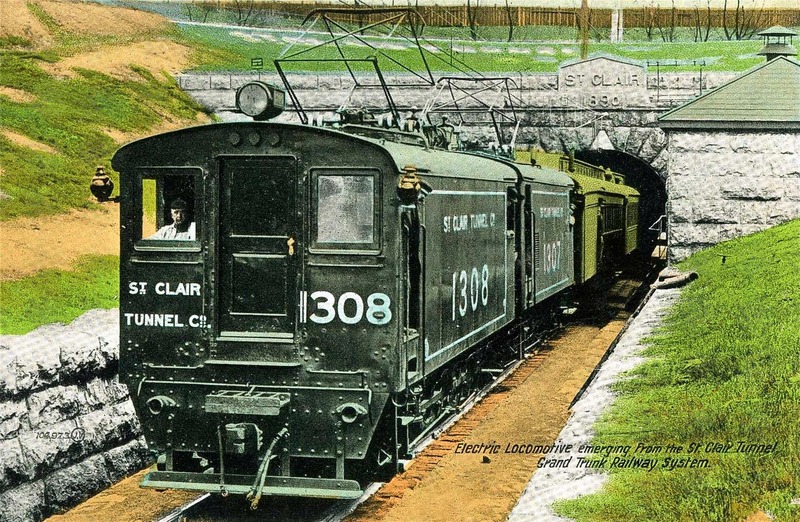 Todays yarn explains why the Canadian National was spending US160M to dig a new tunnel under the St. Clair River at Port Huron Michigan, next to the Grand Trunk Railroad Tunnel completed in 1890. A major bottle-neck was created at the Sarnia - Port Huron Ports of Entry, because excess height, auto rack, and double stack well cars, had to be barged across the St. Clair River. Despite lowering the floor in 1949, they ssimply wouldin't fit in the aging tunnel. The St. Clair River connects Lake Huron to Lake Erie, passing through Lake Saint Clair. 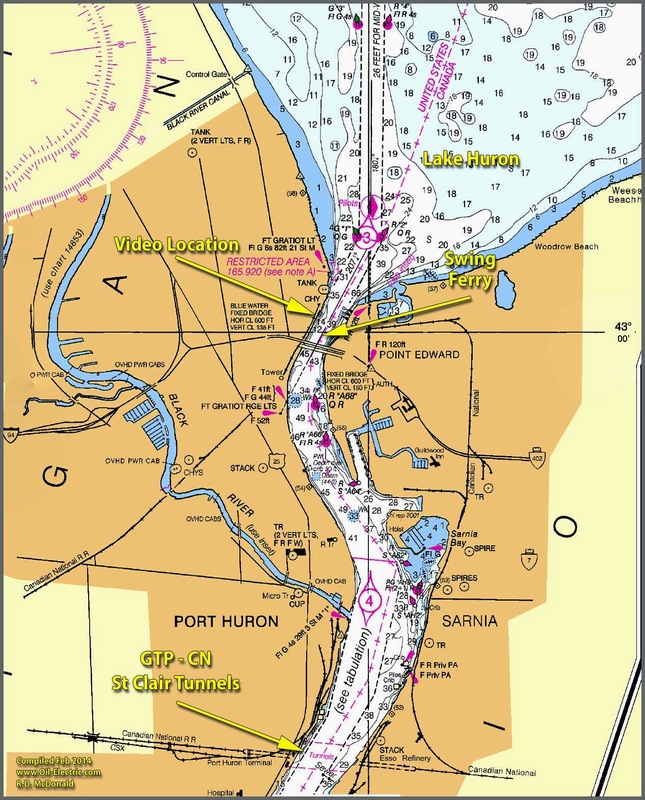 The St. Clair River is about 39 miles long from Lake St. Clair via St. Clair Cutoff Channel and South Channel to the head of the river at Lake Huron. The lower 11 miles of the river is a broad delta through which numerous channels flow into Lake St. Clair. South Channel and St. Clair Cutoff Channel form the main navigation route through the delta and connect with the dredged channel across Lake St. Clair. 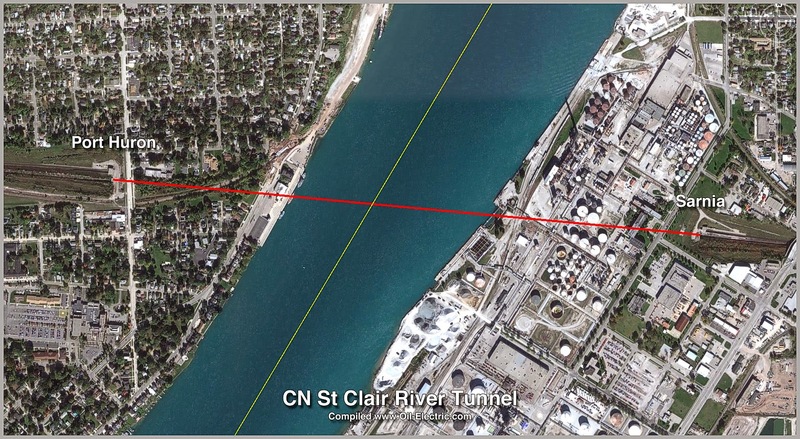 Currents for Point Edward, head of the St. Clair River are given at high water flow of 230,000 cubic feet per second (cfs), medium water flow of 188,000 cfs, and low water flow of 130,000 cfs, respectively. Point Edward: 3.9 mph, 3.3mph, and 2.5 mph. The rapids section extends from about 1,000 feet above to 200 or 300 feet below the Blue Water Bridge. The Grand Trunk Railway of Canada operated a large railway system by 1880, when it completed lines linking Chicago to the United States east coast. 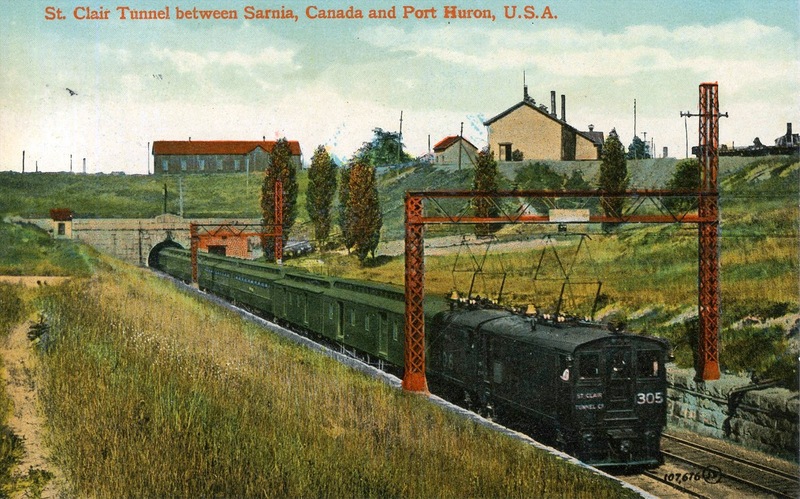 The railroad arrived at Sarnia Ontario in 1859. 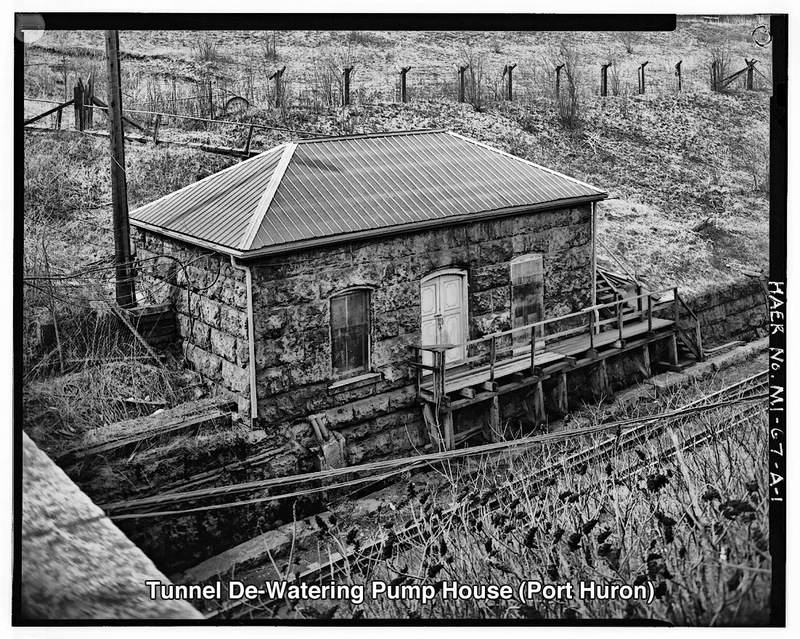 On the opposite side of the St. Clair River, the City of Port Huron incorporates on Feb. 4, 1857. Chicago, Detroit & Canada Grand Trunk Junction Railway Co. begins construction of tracks 57 miles from Fort Gratiot (Port Huron) to Chicago via Detroit. From 1859 to 1890, freight and passengers were transported across the river between Port Huron to Sarnia, depending on railroad car ferries, creating a serious bottleneck for the Grand Trunk. A car ferry was introduced that eliminated the need to unload and reload cargo as the new ferry could transport the railway cars themselves across the river. But the ferry was unlike all others! 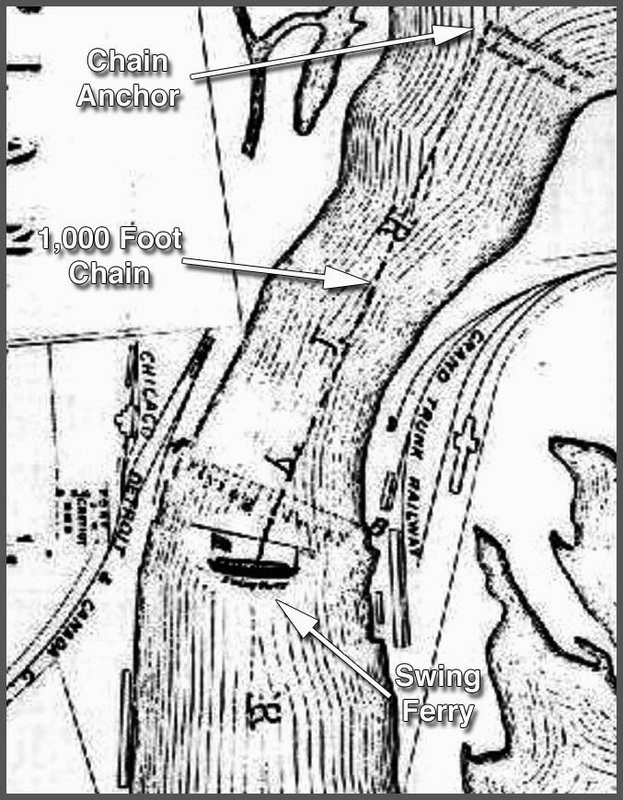 The swing ferry (reaction ferry) was anchored by a chain of about 1000 feet near the American shore, and, depending on her angle, was driven by the current in the rapids from one shore to the other. 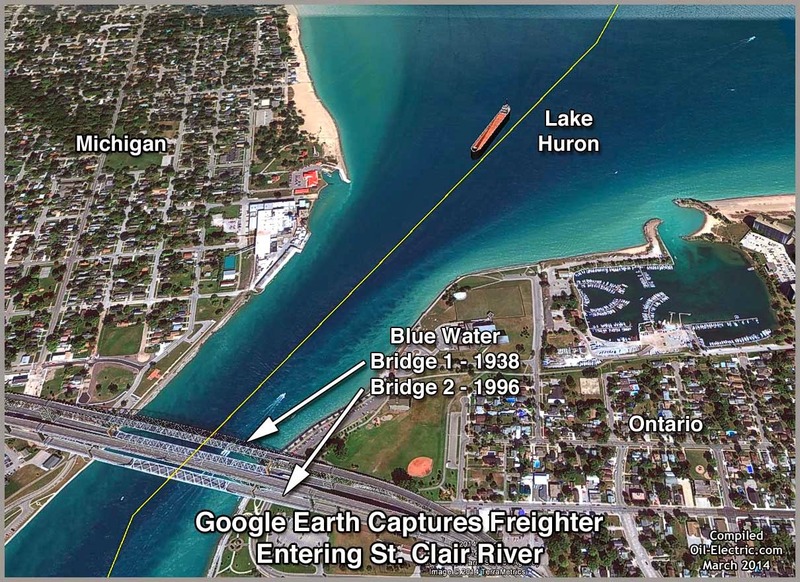 Her slips were at Point Edward, above Sarnia, and at Fort Gratiot in Port Huron, almost exactly at the piers of the present Blue Water Bridge. Reaction ferries are not uncommon. There are five operating in British Columbia. But usually they are tethered to a shore-to-shore static cables. 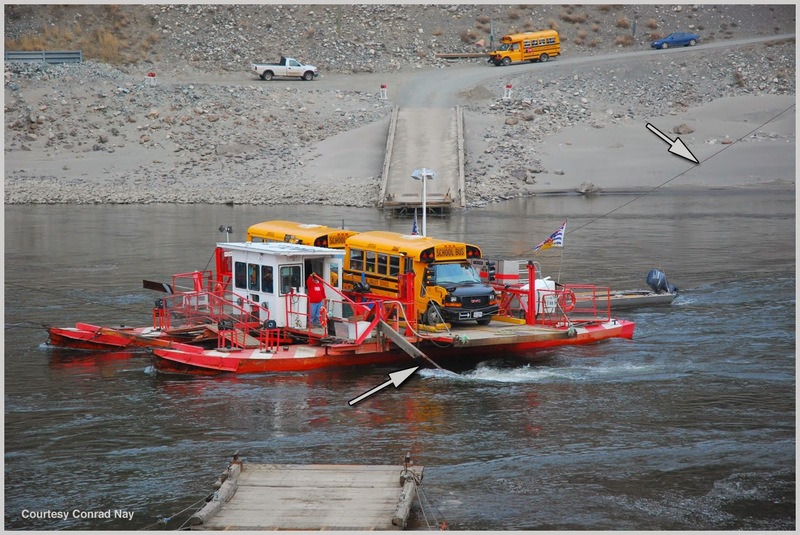 Here is the Lytton reaction ferry operates across the Fraser River in BC. Look carefully as the ferry returns. You can see the overhead tethers (between red/white pylons,) and look carefully at the wheel house. You can see the skipper manipulating the rudder. When river currents are two treacherous to run the ferry, passengers walk a detour. Canadian National built a protected pedestrian sidewalk next to the main line over the river. A swing ferry at a point of such heavy traffic as the rapids presented a menace to navigation. About 1867, she collided with an upbound steamer, severing her chain, and drifting uncontrolled down the river. The schooner Reituker picked her up off Butler Street, Port Huron. The vessel, the first of its kind, and the only one in the world for twenty years, was used constantly until the accident in 1867. 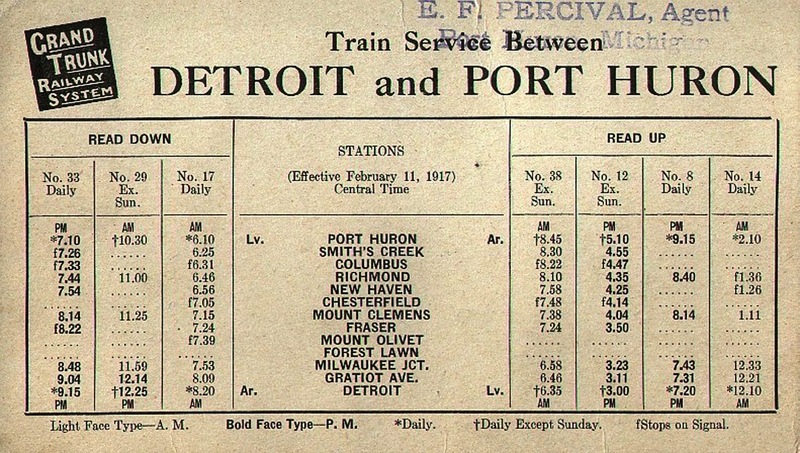 In 1872, the Grand Trunk prepared to retire the swing ferry, enlarge the slips at Poi nt Edward and Fort Gratiot, and put in service a self­ propelled car ferry, International. She was constructed and deconstructed in Great Britain and shipped like a model kit to be reassembled in Port Huron. Steam ferries carried trains across the river until Sir Henry Whatley Tyler, president of the Grand Trunk Railway, decided that a tunnel was the solution to the untenable traffic jamb. Hobson made two failed attempts to drive the tunnel by traditional means, from December 1886 - July 1887 and again in April - July 1888. 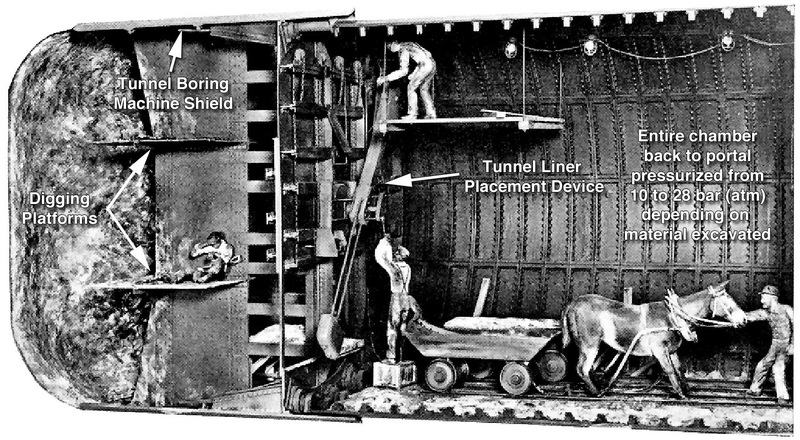 After completing a detailed set of test borings along the tunnel route, Hobson decided to design a tunneling shield and to start tunneling from a point nearly one-third of a mile from the riverbank. 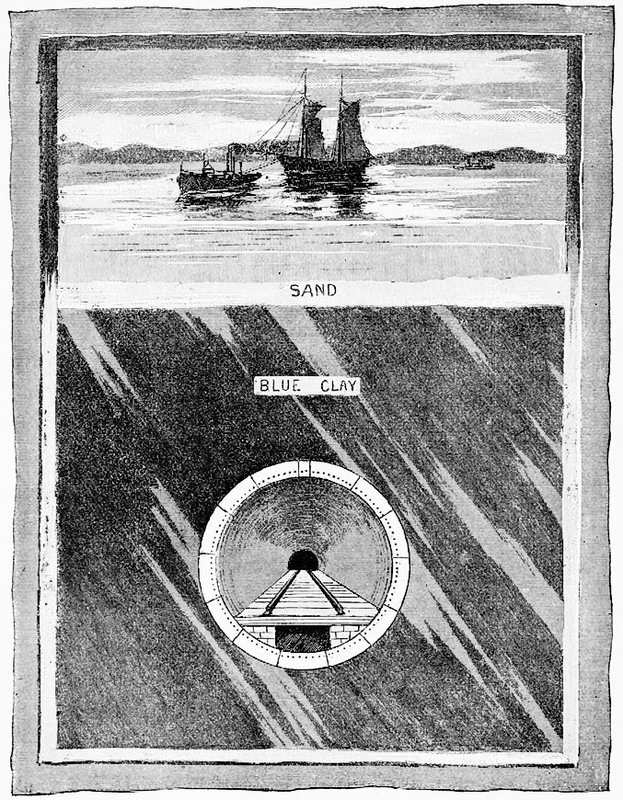 Identical Shields were launched in Sarnia and Port Huron, to meet mid-river. For most of the way, the clay was firm and there was little air leakage. It was found that horses could not survive in the compressed air, and so mules were used under the river. "Throughout the entire preliminary consideration of the project there was a marked sense of caution that amounted to what seems an almost total lack of confidence in success. 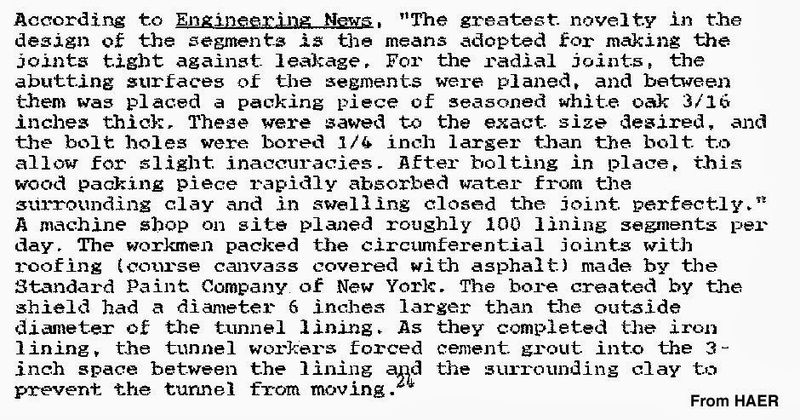 Commencement of the work from vertical shafts was planned so that if the tunnel itself failed, no expenditure would have been made for approach work. 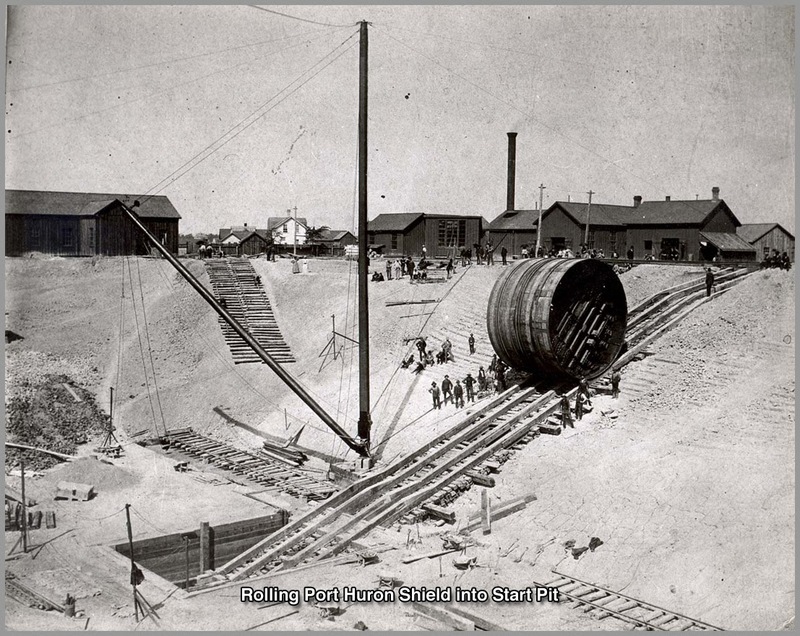 "In April 1888, the shafts were started near both riverbanks, but before reaching proper depth the almost fluid clay and silt flowed up faster than it could be excavated and this plan was abandoned. After this second inauspicious start, long open approach cuts were made and the work finally began. "The portals were established in the cuts, several thousand feet back from each bank and there the tunneling itself began. The portions under the shore were driven without air. 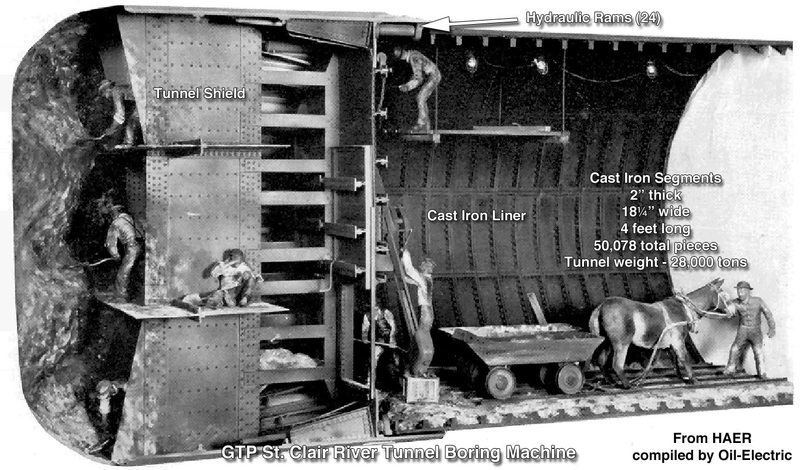 When the banks were reached, brick bulkheads containing air locks were built across the opening and the section beneath the river, about 3,710 feet long, driven under air pressure of 10 to 28 pounds above atmosphere. 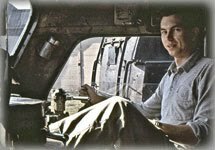 "For most of the way, the clay was firm and there was little air leakage. It was found that horses could not survive in the compressed air, and so mules were used under the river. In the firm clay, excavation was carried on several feet in front of the shield. About twelve miners worked at the face. However, in certain strata the clay encountered was so fluid that the shield could be simply driven forward by the rams, causing the muck to flow in at the door openings without excavation. 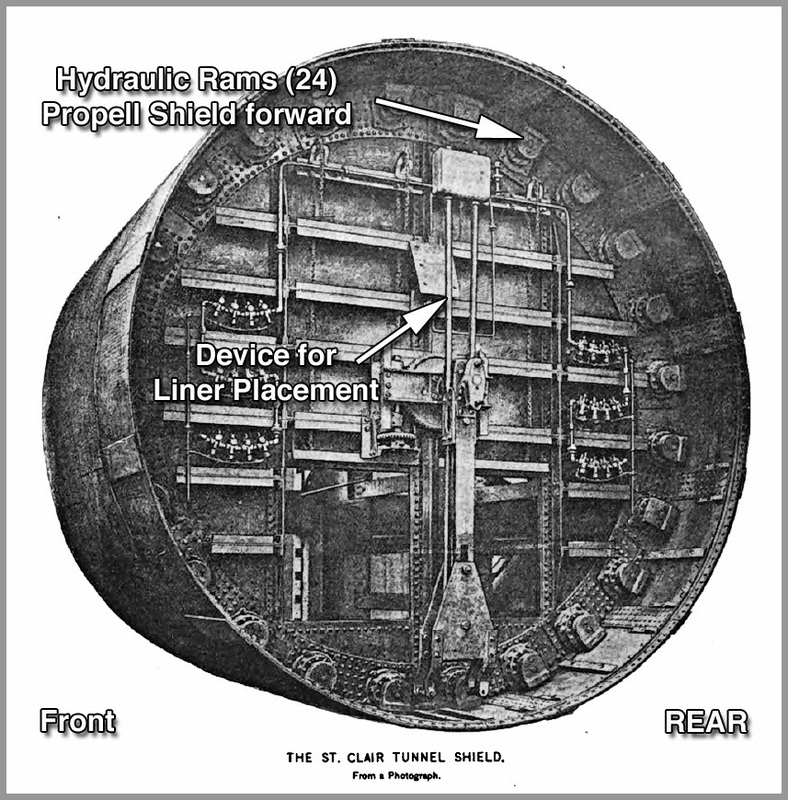 After each advance, the rams were retracted and a ring of iron lining segments built up, as in the Tower Subway. Here, for the first time, an "erector arm" was used for placing the segments, which weighed about half a ton. "In all respects, the work advanced with wonderful facility and lack of operational difficulty. Considering the large area, no subaqueous tunnel had ever been driven with such speed. The average monthly progress for the American and Canadian headings totaled 455 feet, and at top efficiency 10 rings or a length of 15.3 feet could be set in a 24-hour day in each heading. 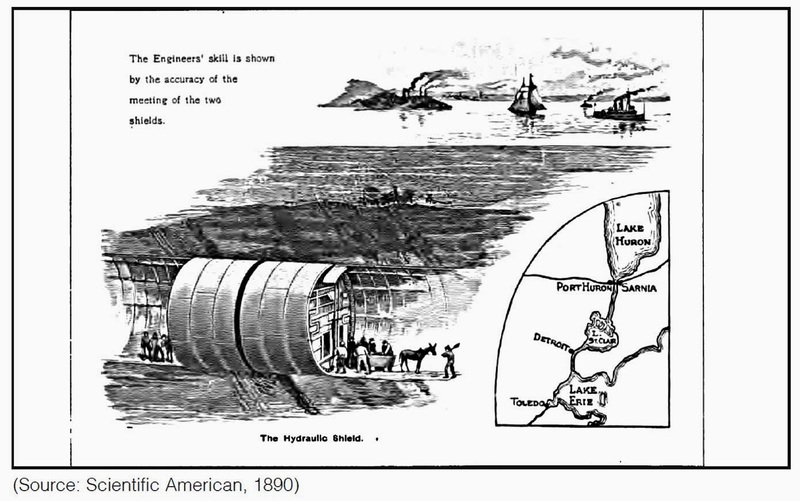 The 6,000 feet of tunnel was driven in just a year; the two shields met vis-à-vis in August of 1890." 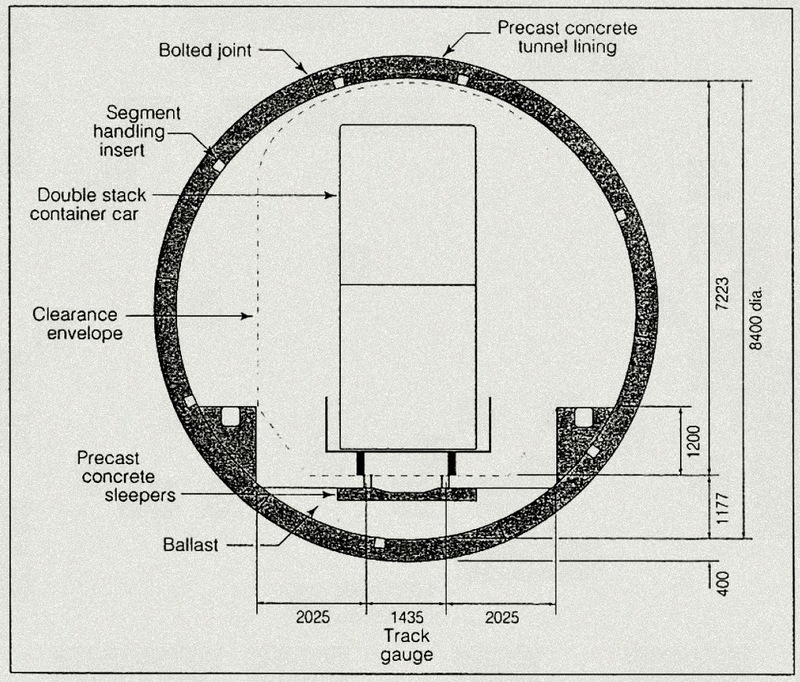 From "Tunnel Engineering. A Museum Treatment," Robert M. Vogel, 2012. This series of photographs were taken in 1993, to accompany the Historical American Engineering Record. 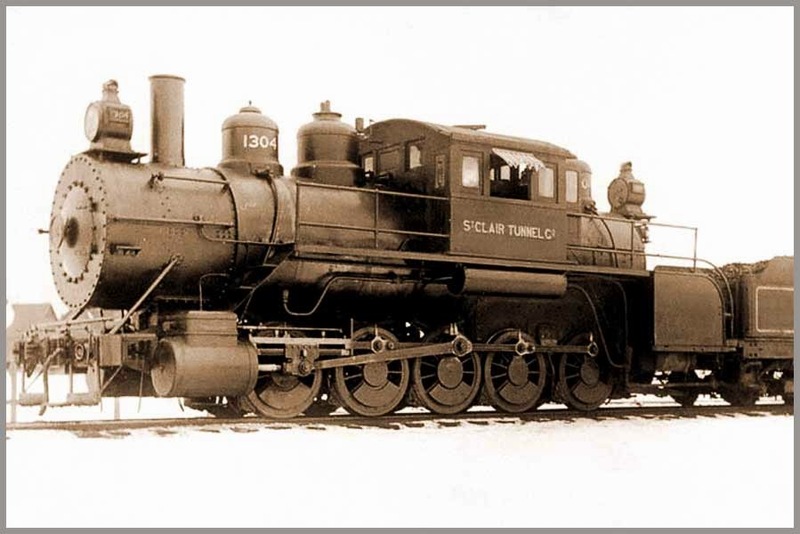 "Although the tunnel locomotives burned either coke or anthracite coal to reduce smoke emissions, the locomotives nevertheless produced carbon dioxide and carbon monoxide. Both gases can cause death. The ventilation system normally took 45 minutes to clear the tunnel of all gases after a train had passed through. 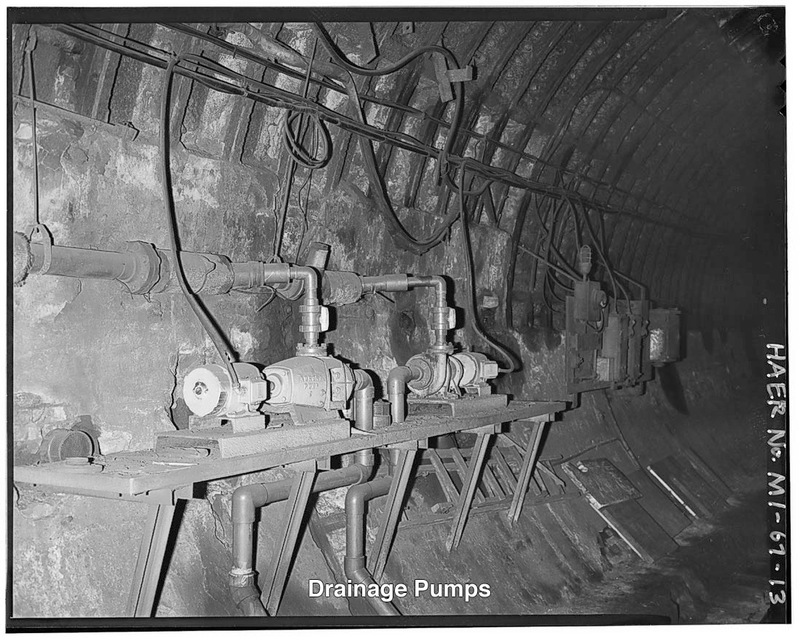 Joseph Hobson, Tunnel Project Engineer, testified in 1897 that he had removed the original ventilating pipes after only a few years of use because they worsened tunnel ventilation. "If a train passed through the tunnel without delay, the gases did not pose a threat to life. 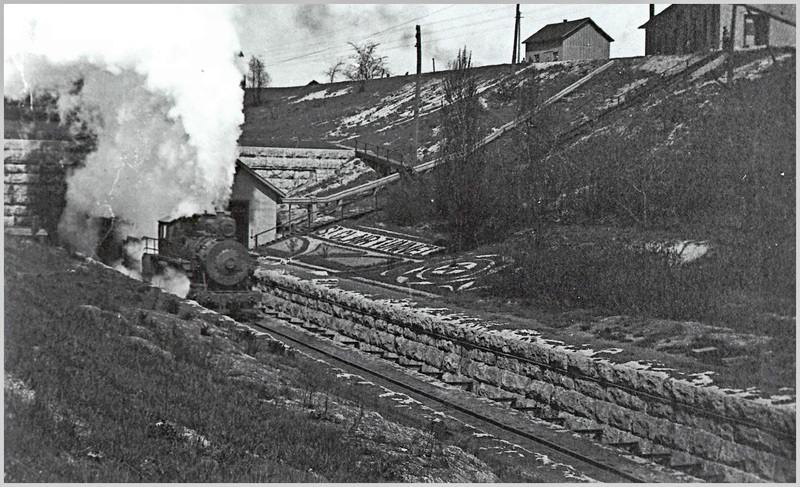 However, as a locomotive was ascending the incline leading out of the tunnel, the couplers connecting the cars were subject to great strains and would often break, leaving part of the train behind in the tunnel. This would endanger the conductor and brakeman, who normally worked from the caboose, as well as the locomotive engineer and fireman if they returned to the tunnel to retrieve the missing cars. "The first fatal accident: occurred on 31 January 1892, only three months after the tunnel opened to regular freight traffic. Following a train break in the tunnel, conductor George Hawthorne and brakeman Joseph Whalen were overcome by fumes and Hawthorne died. 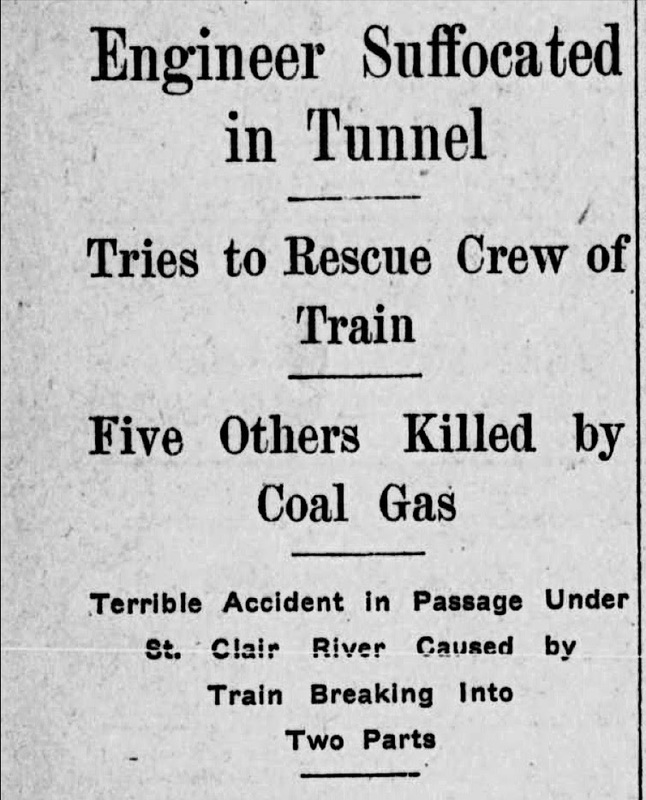 "The breaking of couplers in the tunnel became so commonplace that more fatal accidents were inevitable. In the four years ending 30 June 1899, for example, when nearly 16,000 trains traversed the tunnel each year, a total of 278 trains broke apart in the tunnel, roughly 70 per year. "A second and more serious accident, took place on November 29, 1897, resulting in the death of three men, including the engineer, one brakemen, and the conductor. 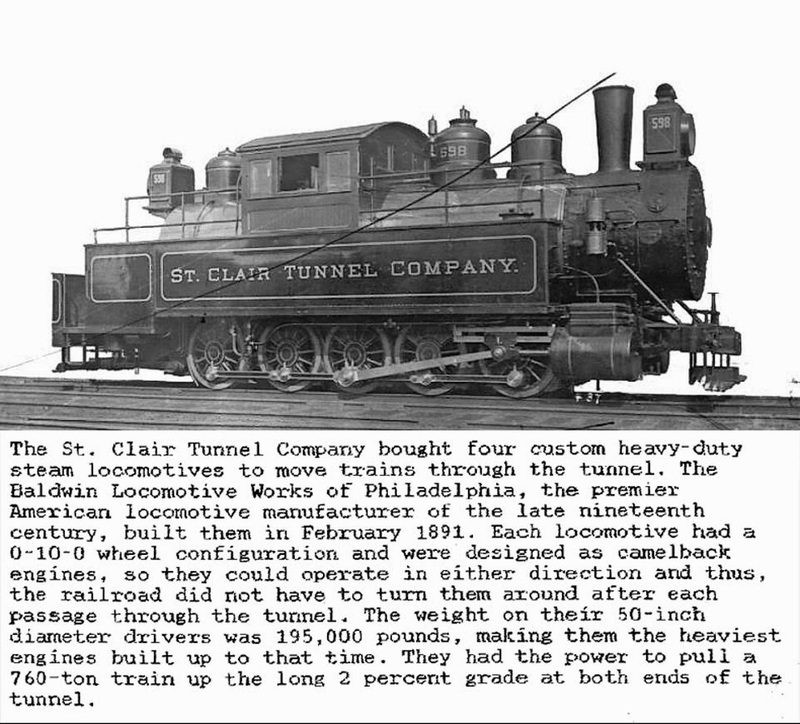 "In the wake of the third fatal accident, Grand Trunk moved quickly to convert the tunnel to electric traction. 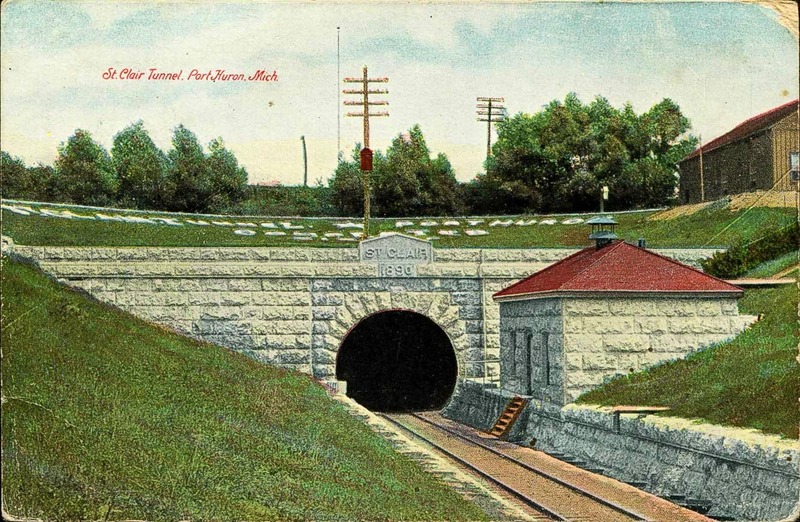 In December 1904, General Electric and Westinghouse, submitted proposals to electrify all tunnel operations. 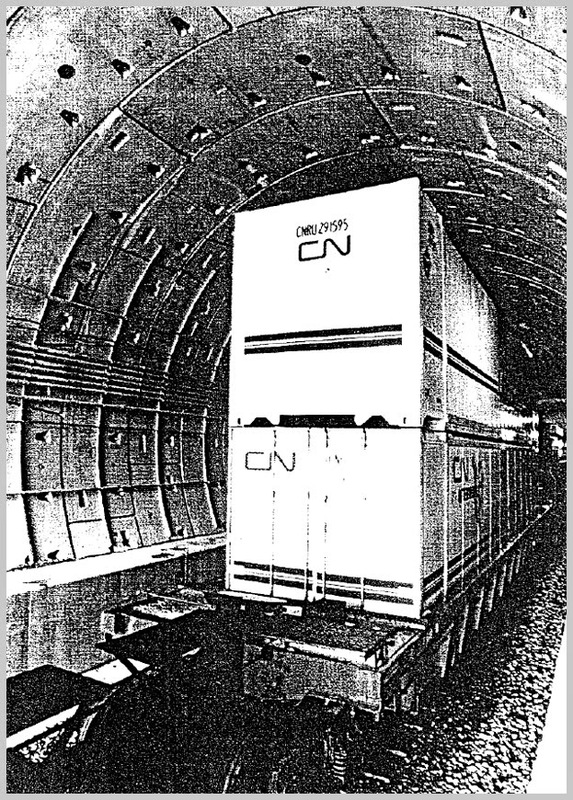 "Grand Trunk specified that the electric haulage system must, be able to pull a 1,000-ton train between the two tunnel terminals in 15 minutes, and maintain a train speed of at least 10 miles per hour up the 2 percent grade leading out of the tunnel. 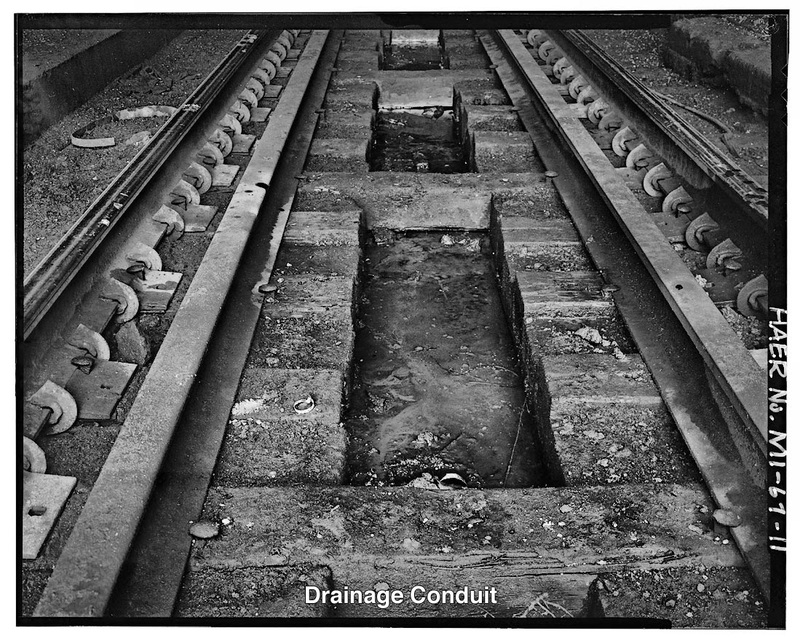 "General Electric proposed a DC system of 600 volts using a third rail, but the Grand Trunk accepted the Westinghouse proposal based on the use of a 3,300-volt AC single-phase system,[overhead trolley]. "According to the Port Huron Daily Times, the entire project cost more than $1 million. Although the Grand Trunk signed the electrification contract with Westinghouse in January 1906, the first electric locomotive did not pull a freight train through the tunnel until 20 February 1908." This tunnel has undergone only minor changes since its opening. 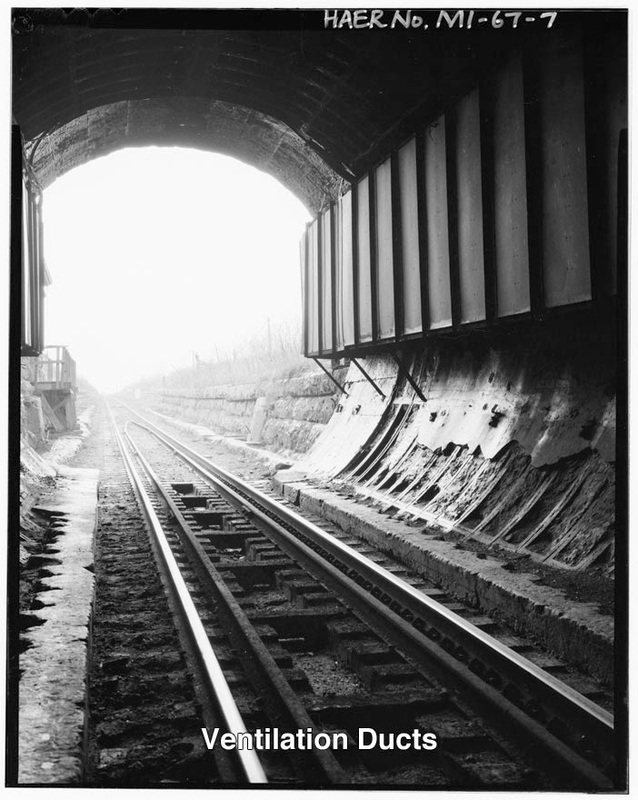 The railroad lowered the tracks in 1949 to allow taller freight- cars to use the tunnel. Diesel locomotives went into service in September 1958 and the railroad installed new ventilation equipment to handle the diesel fumes. 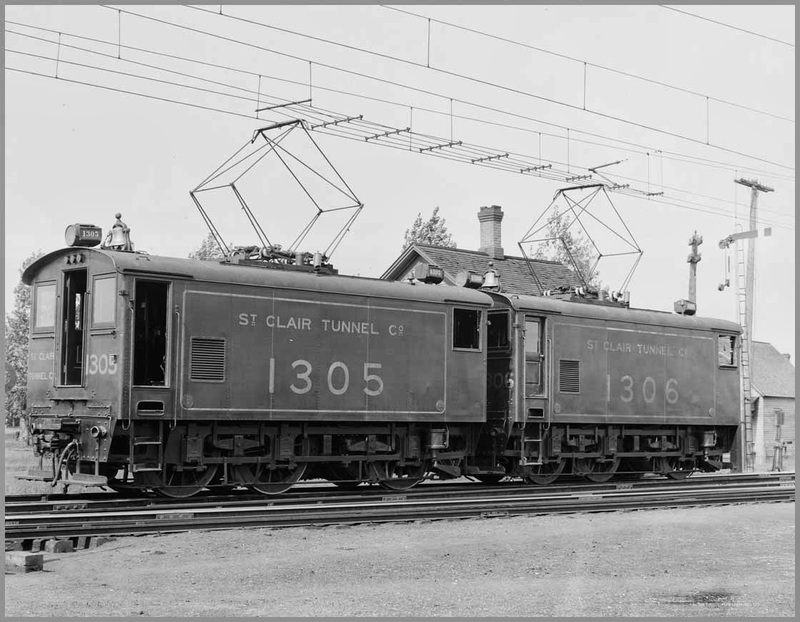 Despite the tunnel, excess height, auto racks and double-stack rail cars moving between Michigan and Canada still had to be loaded onto barges and "floated" across the St. Clair River. So Canadian National decided to bore a new tunnel under the river, eliminating the choke point. 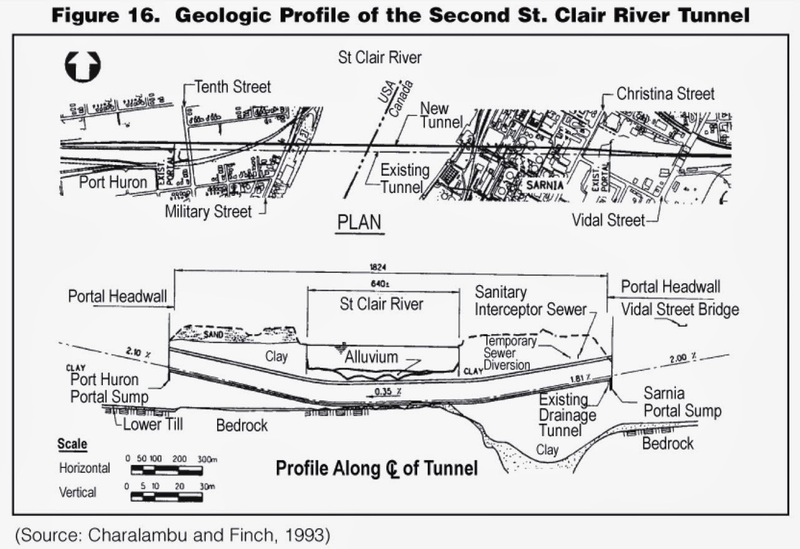 On January 29, 1993, the U.S. Army Corps of Engineers approved construction of a US$150M railroad tunnel under the St. Clair River, funded by CN. 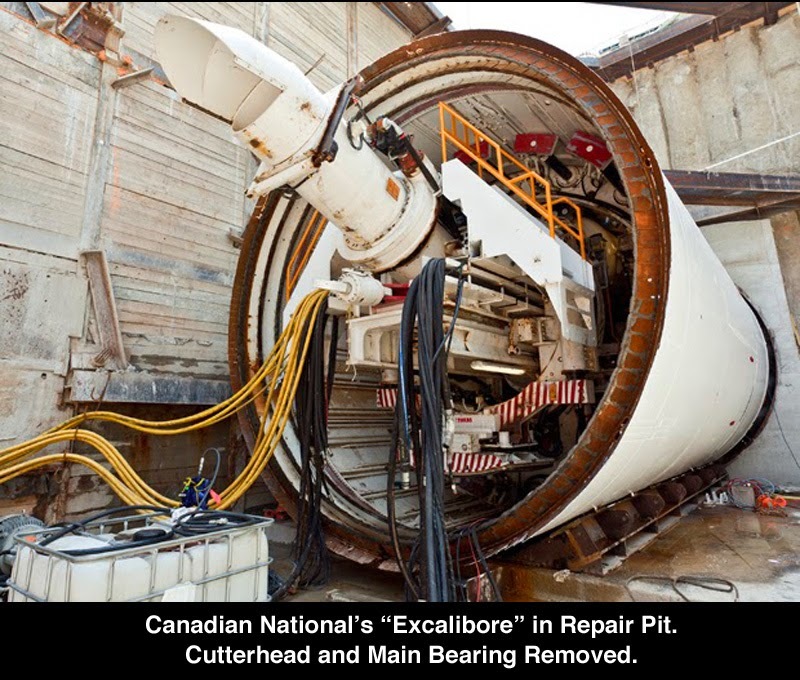 Like Seattle's "Bertha," CN's "Excalibore" lost the main bearing seal. Fortunately, the Tunnel Boring Machine (TBM) was not under the river. Stalled beneath an Esso (Imperial) oil refinery at Sarnia, a retrieval pit was constructed to allow access to the Cutterhead, which was removed to gain access to the main bearing. The repair took nine months - a hint of what Seattle Tunnel Partners are facing. 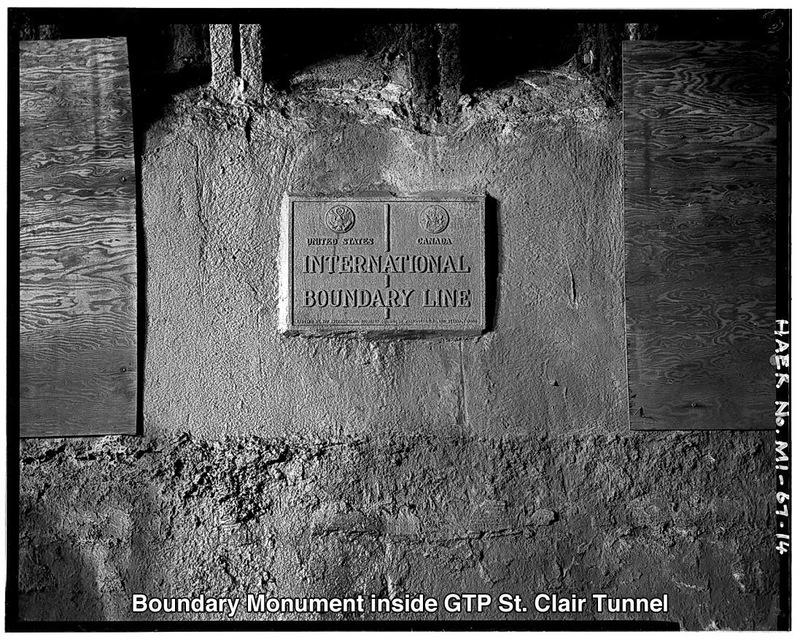 "Excalibore," the TBM broke through at Port Huron on December 8, 1994 and the new tunnel was dedicated on May 5, 1995. The original tunnel was retired and filled in with sand. The new tunnel measures 6,129 feet (1,868 m) from portal to portal with a bore diameter of 27 feet, 6 inches (8.4 m) with a single standard gauge track. 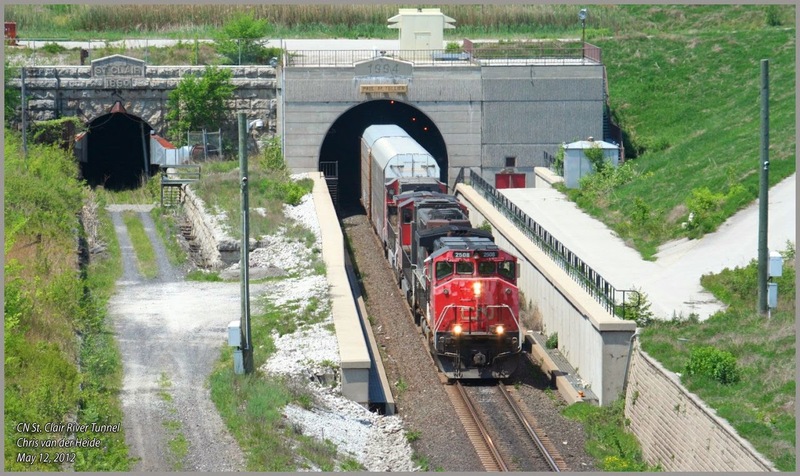 On November 30, 2004, the tunnel was renamed in honor of Paul Tellier, the CEO of Canadian National Railway (CN) from 1992 to 2002 and the man who had the new tunnel built. And the tug and barge "fleet" was retired. Eliminating the barge operation cuts 12 hours shipping time between Chicago and Toronto, a significant saving to customers. CN rail tugs laid up at Sarnia. March. 25, 1995. 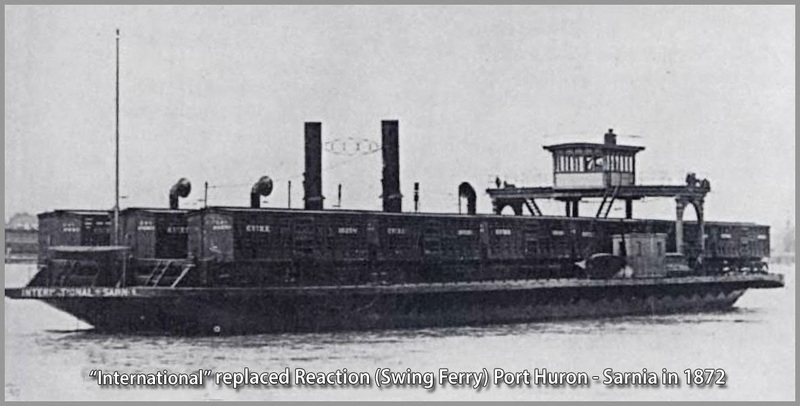 This video was shot at approximate location of the anchorage for the Swing ferry at Fort Gratiot in Port Huron. This is the outlet of Lake Huron, hence the "headwater" of the St. Clair River. You can clearly see the velocity of the current. 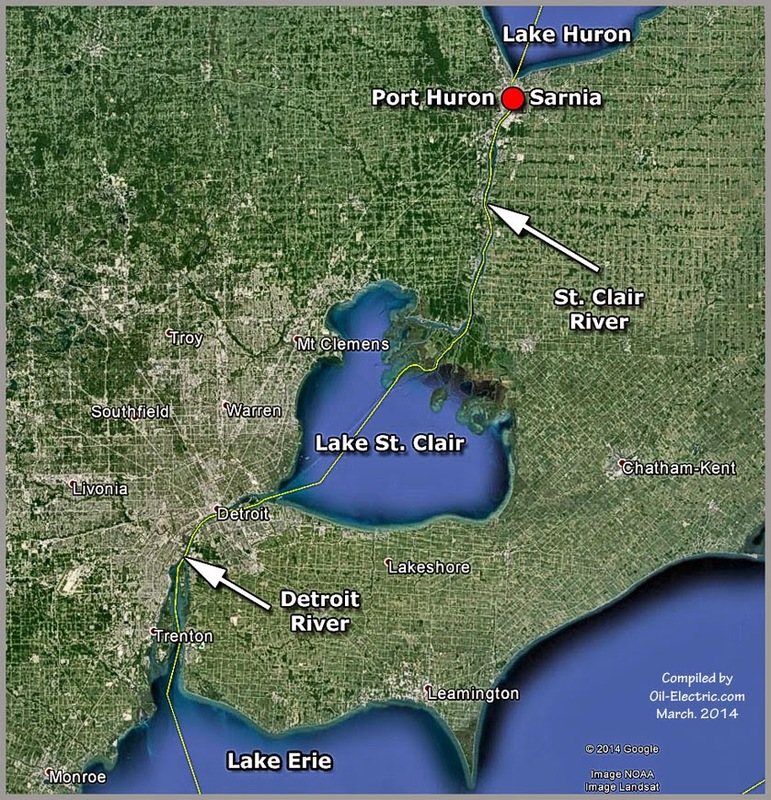 Students of geography struggle with the notion of the St. Clair River being a "river" or a "strait." A strait joins two bodies of water, whilst a river has a point of origin at elevation, with gravity propelling it to a static level. This argument also shadows the Detroit "River." The Blue Water Bridges can be seen, the nearest bridge opened in 1938, the distant bridge opened in 1996. And here is a totally awesome video taken from the bridge of a Great Lakes freighter, entering the 800 foot wide St. Clair River. Average current 4 mph. That means the freighter must double that speed in order for her to respond to rudder commands! This video feartures a southbound Canadian National freighter exiting the St Clair Tunnel on the Port Huron side of the "river." In this video, another freighter descends the 2% grade down to the tunnel under full dynamics! When the camera view switches to the tunnel, just beyond the flag pole is the Esso Refinery. That is where CN's Tunnel Boring Machine "Excalibore" was stuck for nine months. Toward the end, a great comparison of the new bore next to the original bore. Baffled by the strange cargo near the end of this clip, I turned to my contemporary up in the Great White North, who explained "Auto frames on Trailer Train flat cars." Finally, the obligatory train ride through the tunnel. Watch for "the light at the end of the tunnel." 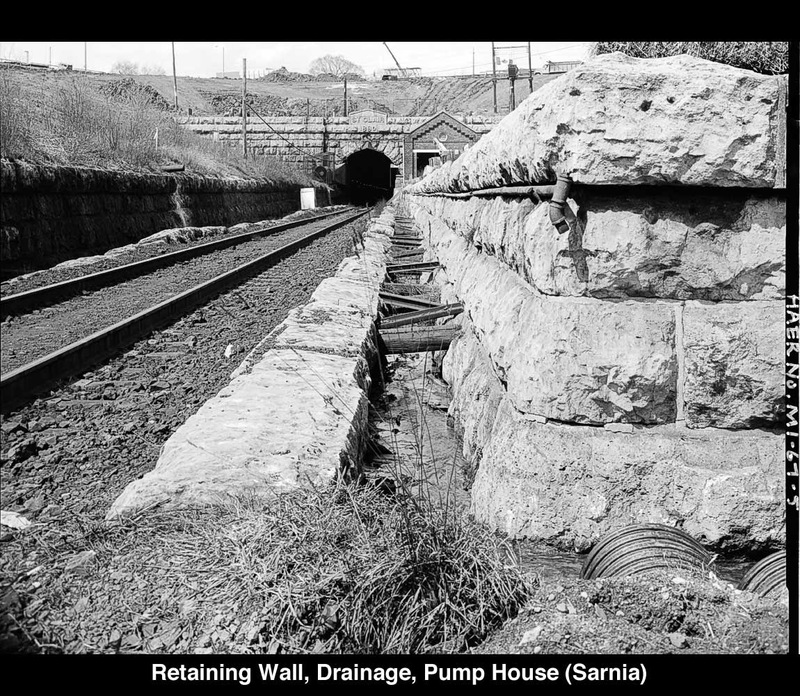 Excellent accounting of the tunnel, history and present use. Loved the pictures and videos as usual. Comprehensive and enjoy how you weave stories and pictures together. Always want more, Thank for hard work! Nice post, Robert. A nice nexus of ships and trains in your links. Thanks also for the tip-of-the-hat to Trackside Treasure. The only thing potentially slower than train watching is ship watching. But one gets a good view. Tunnel boring? Boring can be interesting, too! There are radios that monitor the traffic and several web sites and apps that track ship movement worldwide that show you when a ship passes close to you and if it will enter your port. The radio transmitters are not that powerful so you only hear them when they radio the harbor, then you can look, so not much watching at all. A big difference when in England they stood near the tracks hoping a train would pass so they could log the engine's number. (AKA Train spotters). 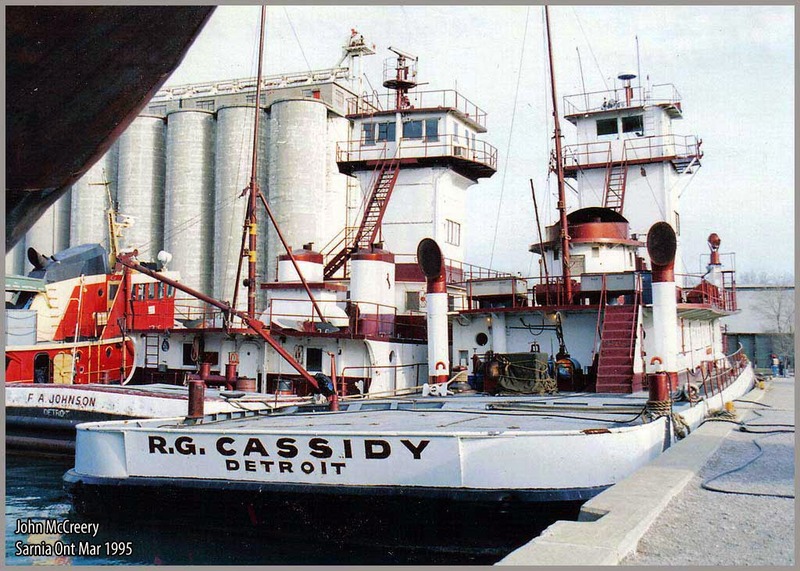 Nice article except the two tugs pictured were Norfolk & Southern tugs used on the Detroit River . "Get Your Tracks out of Town!"